The Ontario Dairy Council shared in funding a study showing that the anti-cancer properties of green tea can remain bioavailable when extracted and placed in a milk medium. The Dairy Council is looking to enhance profits with a value-added substance. Which leads one to ask, Why not just drink green tea? 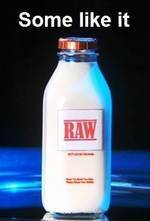 Even better, stop pasteurizing and homogenizing milk; stop adding hormones and antibiotics to the cow’s diet and reap the benefits of a truly probiotic superfood: organic raw milk. Epigallocatechin gallate (EGCG), the major extractable polyphenol in green tea and the most biologically active, inhibits tumor formation, reduces cancer cell proliferation, increases normal cell death, and suppresses the formation of new blood vessels feeding tumors, the study reported. And, for the junkie in your life, EGCG in green tea prevents morphine dependence. There are dozens of other benefits to green tea, so it’s not surprising science is looking for ways to extract EGCG. But to put it in milk? For several decades, dairy producers have added Vitamin D to milk, an important nutrient connected to physical and mental health that also helps with uptake of other minerals and nutrients. It’s most often extracted from the lanolin in sheep’s wool. Given the growing abundance of artificial clouds, most of us are Vitamin D-deficient, so adding it to commercial milk may not be such a bad thing. Adding fluoride to water, though, takes us into an entirely different realm for a number of reasons. First, the slurry added is agricultural waste which is toxic, as the label on this bag revealed, to “heart, kidneys, bones, central nervous system, gastrointestinal system, teeth.” Those bags were found at a city water plant. In 2010, over 2,000 professionals called for an end to fluoridated water. Coincident with the publication of The Case Against Fluoride: How Hazardous Waste Ended Up in Our Drinking Water and the Bad Science and Powerful Politics That Keep It There, the group also published this 30-minute video highlighting the main points against fluoridation. Significant to water fluoridation, medicinal genetically modified foods (like blood rice) and adulterating our foods with medicine is the idea that mass drugging a population violates medical ethics since it lacks informed consent. Modern pharmacology recognizes that individuals react differently to the same dosage of a given drug. Once a food is grown, adulterated, or genetically altered to treat disease, it’s no longer just food. It’s medicine – and not the kind we evolved with, because it’s concentrated and synthetic and often has as-yet unknown deleterious side effects. He concludes that while these activities may be “legal” in that power-holders wrote laws to allow such mass contaminations, they are neither lawful nor just. Medicating our food for nefarious motives or for mere value-added profit is symptomatic of a bent society lacking in community values. The more that Big Food seeks to enhance profits, the scarier their products get. Best to get your dairy on the farm, get to know your farmers, and opt out of the industrial food system. This piece originally published at Activist Post.